Release Date: May 18th, 2007 (Quad Cinema) by 7th Art Releasing. BASIC PREMISE: A documentary about the Six-Day War when Israel fought against Jordan, Syria and Egypt in June of 1967. ENTERTAINMENT VALUE: Six Days provides a mildly fascinating, timely look at the Six-Day War and the events leading up to it, but fails to be intriguing or surprising enough. 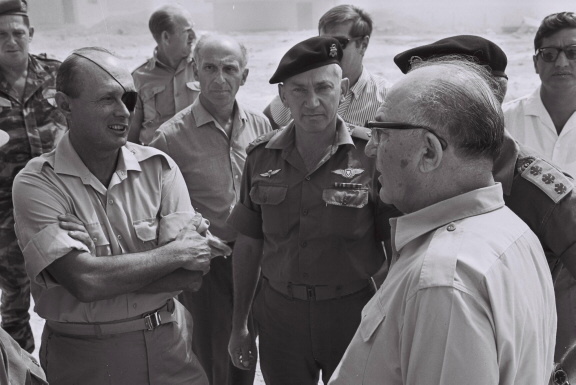 Israeli Prime Minister Levi Eshkol wanted to expand the borders of Israel while Egyptian President Jamal Adel Nasser intimidated him to use the Israeli army to attack Egypt. The Israeli military commander, Moshe Dayan, tried his best to stop going into battle, which he felt would do more harm than good in the long run. However, his attempts to stop the Israeli army were futile—especially during an important speech on the radio where he stutters, signaling to many people that he wasn’t confident that Israel is safe from military attacks. It turns out the Adel Nasser lied to the Egyptian public that they were winning the war despite that the Israeli military completely wiped-out Egypt’s military by surprise. Director Ilan Ziv combines narrated archival footage along with interviews to document these events while counting down how many days until the inevitable war begins. Although he approach the Six Day War in a coherent way, Ziv includes too many historical facts without enough synthesis, which makes it feel like a documentary you would watch in a high school history class or on the History Channel. It would have been much more intriguing to connect all of the facts to the events going on today during the conflict in the Middle East. Perhaps he could have includes some interviews with natives from Israel, Egypt, Syria, and Jordan who describe their feelings and accounts of the Six-Day War. He doesn’t have to offer a solution to the conflict, but at least spend more time on the human/civilian side of the Six Day War rather than merely the political side. INSULT TO YOUR INTELLIGENCE: Not enough synthesis of the historical facts and events. IN A NUTSHELL: Mildly fascinating and timely, but lacking synthesis, intrigue and surprises.